Mercedes in no doubts the trend setter of coupe-like sedans. If you have been visiting our website since time, the release of Audi S7 and BMW 6-series Gran Coupe marks the glory company created. 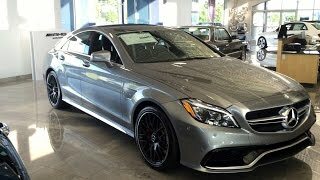 For the year 2015 company has something new popping out its box of surprise and that’s the re-modified Mercedes-Benz CLS63 AMG 2015 now with more power beneath its hood. 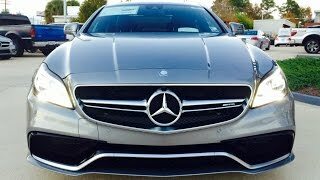 Let us scroll down a little over review of Mercedes-Benz CLS63 AMG 2015 and get to know the changes better. Interior of Mercedes-Benz CLS63 AMG 2015 looks like one with roots in company’s legacy. However moving inside there are some changes you’ll notice. Entering the cabin of Mercedes-Benz CLS63 AMG you’ll notice a new flat-bottom three-spoke steering wheel sitting beside another new incorporation in form of an eight-inch color infotainment system. Beneath this system is bit redesigned center console. Entire interior of Mercedes-Benz CLS63 AMG 2015 comes wrapped in high-quality leather and dipped in chrome accents making it look highly luxurious. For the headliners Mercedes used Alcantara followed by same covering steering wheel and other parts. Exterior of Mercedes-Benz CLS63 AMG 2015 is classy with its looks. Starting with the front fascia you have a new diamond pattern front grille covering part of the revised upper and lower part of its Mercedes-Benz CLS63 AMG face. Beneath air intakes too get bit of modifications while sitting at both the corners are Multibeam LED headlights with integrated daytime running light. 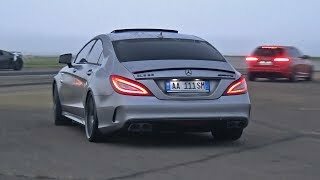 Moving towards rear fascia of Mercedes-Benz CLS63 AMG 2015 changes get subtle featuring wide and elongated taillights and quad exhaust pipes. This entire body rolls upon a new set of wheels making it look more different from the base model. Mercedes-Benz CLS63 AMG 2015 comes in two variants; CLS63 AMG and CLS63 S AMG. Both of these variant come loaded with an AMG 5.5 Liter V8 biturbo engine but while the former delivers total output of 557 hp and peak torque of 720 nm, latter throbs with massive output of 585 hp and peak torque of 800 nm paired to 9G-TRONIC nine-speed automatic transmission.